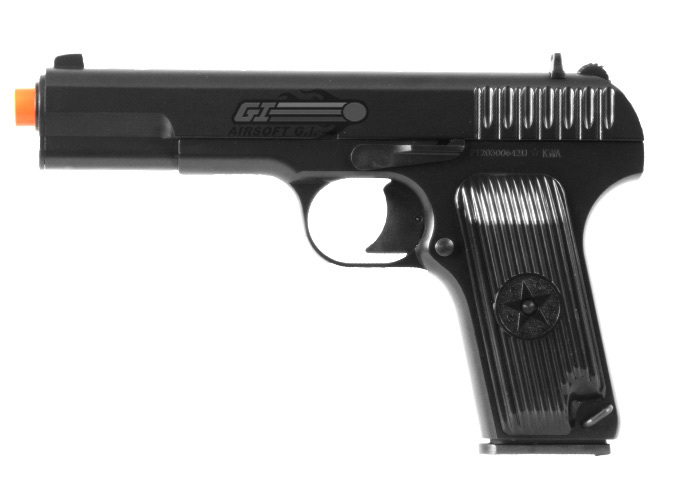 The real TT-30 was developed in the early 1930's by Fedor Tokarev, and was designed to be the issued service pistol for the Soviet Military. After its initial release and trials, some slight changes were made to it's design to help simplify the manufacturing and production process, and the TT-33 was born. 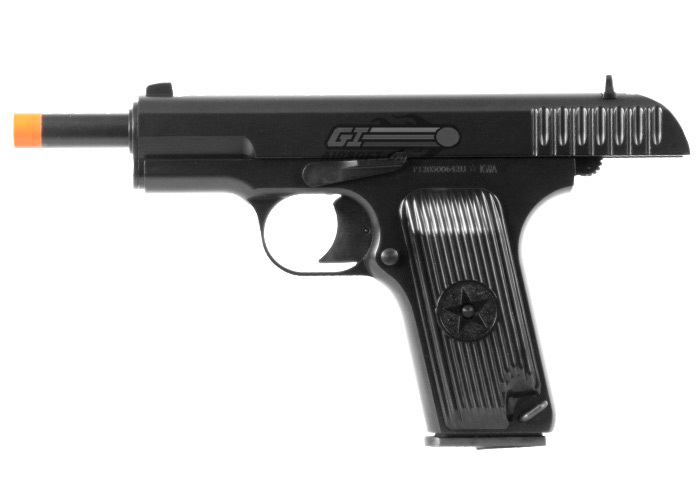 The TT-33 was put through its trials and used by Soviet officers and troops during the second World War, and still remains a very popular Soviet pistol model. 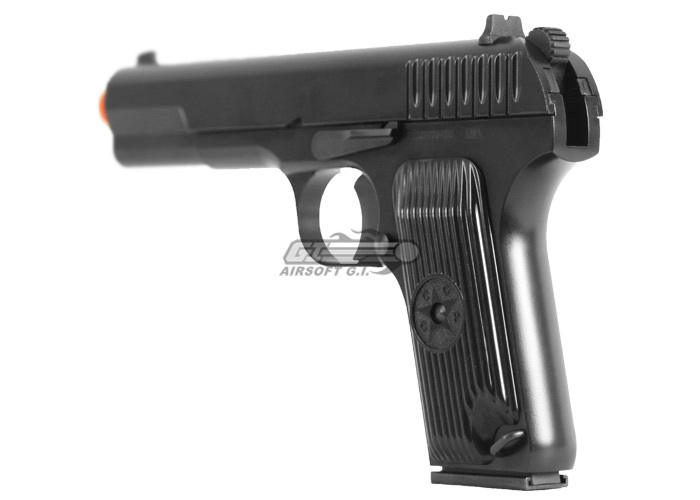 KWA has done an incredible job transitioning the TT-33's rich history into the airsoft market. 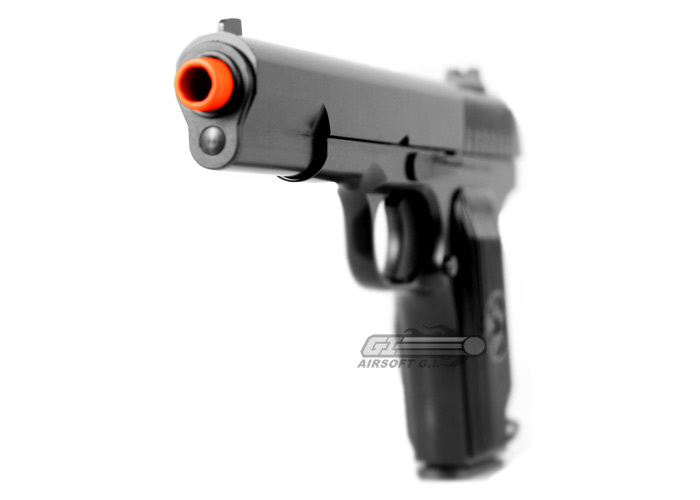 The gun features a full metal slide and frame, giving it a very realistic feel, and making the gun extremely durable overall. 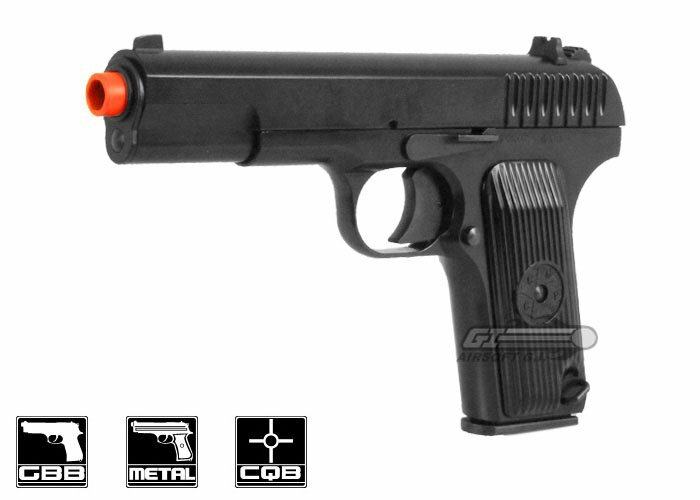 The lightly textured grip provides a solid feel when held, and between the subdued markings and serial number, and the CCCP Star emblem on both sides of the grip panels, the KWA Full Metal TT-33 NS2 GBB has an authentic appearance and feel that is sure to please both players and collectors alike. So i got this gun a couple months ago to finish a Soviet Kit. It looks nice compared to the actual counter part, the weight is about the same unloaded. So it is very realistic. This gun fit comfortably in your hand it is amazing! It shoots a decent range, haven't actually measured it but farther than the SOCOM PUNISHER 1911 i have. Also more accurare, i can hit the same 3 inch diameter with just about all 10 rounds. The Hop up is easy to adjust if you aren't under fire. The mag holds 10 rounds i think they advertise it as 11 though. But if you are looking for something different and pretty darn awesome and accurate then i'd suggest this gun. Feels great in you hand, nice weight. The iron sight for me was something to get used to. None that i have found in the few months i have owned the gun. I picked this up back when it was in pre-order mainly because it was unique, the fact that I favor AK's to M4's has nothing to do with it. It's the first higher grade pistol that I've owned and I love it. 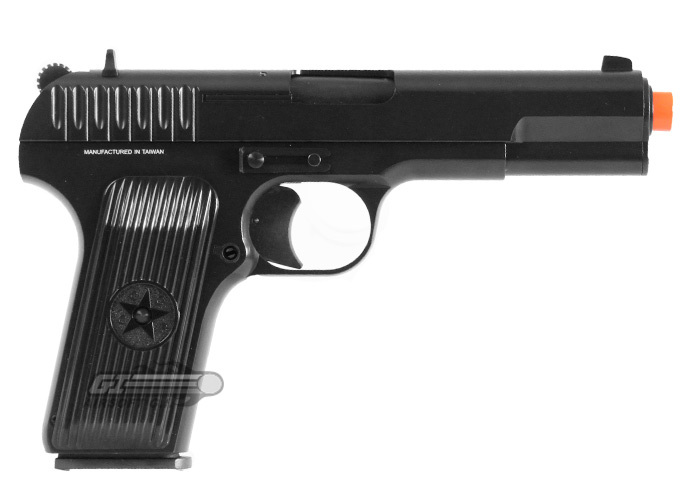 It stands out from all the 1911's SIG's and M9's out there. NS2 system so you get several full mags worth per gas fill. The spring lock on the mag is also a great time saver, just remember to disengage it when you go to chamber a round. 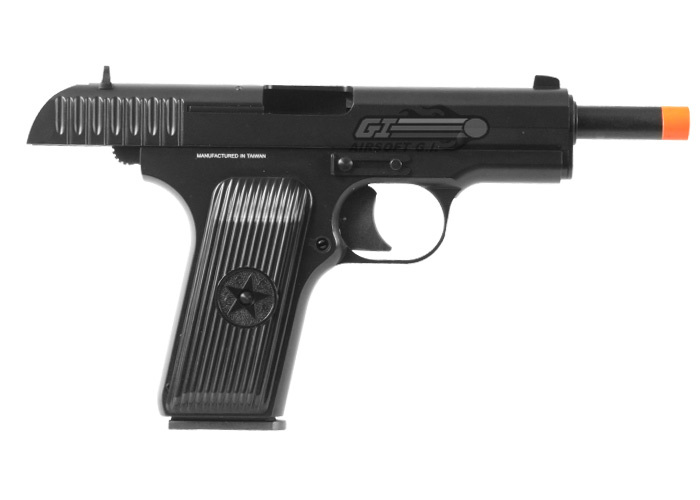 Now for me the smaller size of the frame makes it a lot more comfortable in my small hands, for some of the bigger players out there I could almost see this being a pocket pistol. Finding a holster for it has been the only real problem I've encountered. I ended up getting a reproduction WW2 tanker holster and it fits nicely. I guess the mag capacity, at least compared to modern guns is low, although this holds 2 more than the real steel.